This part of the manual is about how to change the different workspace settings. The gearwheel icon opens the settings section. Here all metadata of a workspace is stored and managed. Also the members of a workspace and the workspaces security settings can be edited in this area. 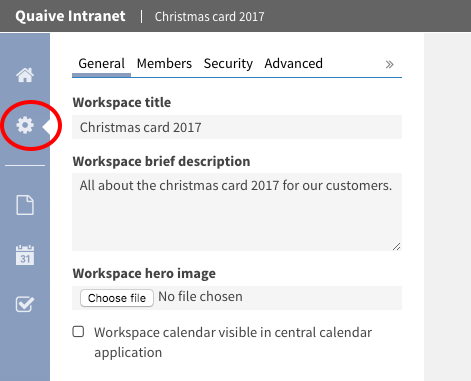 Here general metadata like title, description and the workspace’s hero image can be changed. 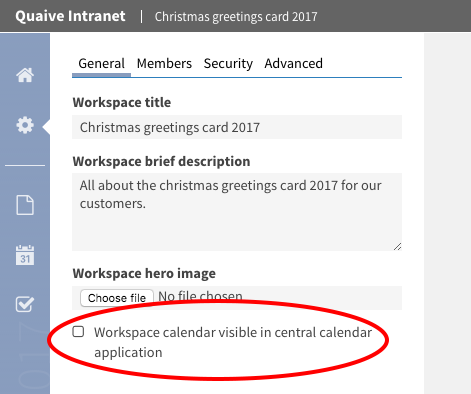 To change a workspace’s title and description just type a new title or description in the text field or area in the sidebar. The metadata is immediately autosaved and a info popup tells you that some attributes have been changed. After the page is reloaded you can see the new workspace title in the breadcrumbs and the workspace header. 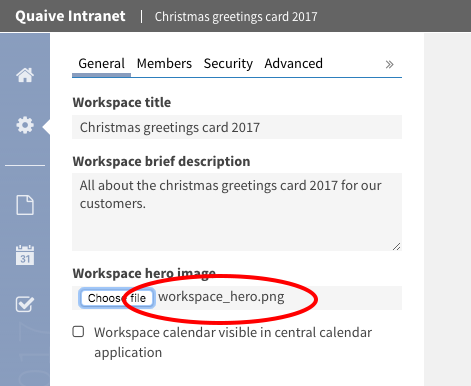 Each workspace can have a hero image to be displayed as a visual element in the workspace’s header section background. Changing this image can also be done in the general settings section. To change the image click the “upload” button in the sidebar and select an image in the opening file browser of your computer. The image will be changed immediately as the metadata again is autosaved. Reloading the page will display the image in the header section of your workspace. In the Members section you can see which users and groups are members of this workspace and which roles they have on it. Here you can add new members or groups, delete existing ones or change the specific role of a member or a group. On the security panel you can see the current security settings of the workspace. This is called the workspace policy. You can get information about the external visibilty, the join policy and the participant policy of a workspace. All these settings of a workspace can be changed for existing workspaces whenever needed. Short explanations offer information about the current and possible options for these settings to make sure what effects on the workspace and it’s content a change has.